Show Details option of a pivot table enable to see the row data for the particular item or entire pivot table. We can see the details in table view for any value item or all items available in a pivot table. 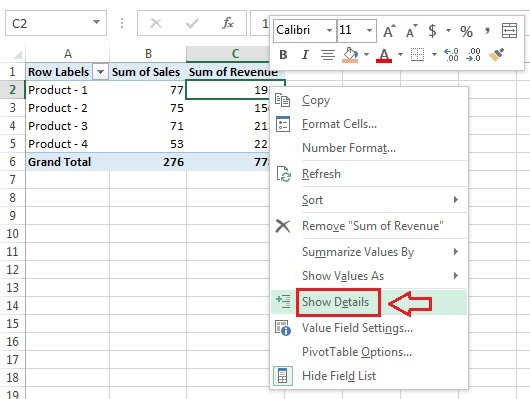 For example we have pivot table Product wise Sum of sales, Sum of Revenue. We have to see the details for Product-1. Click on Show Details option. A new excel worksheet will be added with raw data in table format. Note: To see the detail of entire pivot double click on Grand Total value.